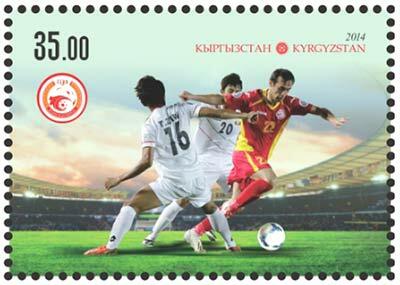 ..:: The postage stamps of Kyrgyzstan 2014 ::.. 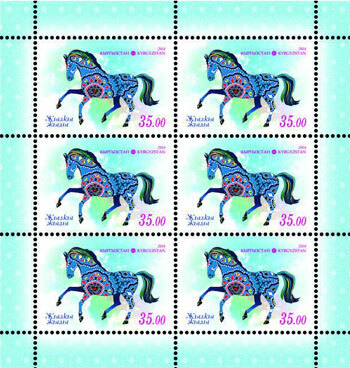 The stamps were printed in sheets of reduced format, sheet contains 6 (2x3) stamps. Sheet size is 100x105 mm., and stamp size is 40x28 mm. 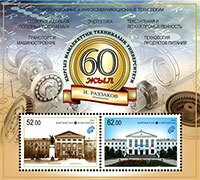 This series printed in sheets of reduced format with design of fields, sheet contains 6 (2x3) stamps. Sheet size is 100x105 mm., and stamp size is 40x28 mm. National horse game "Er sayysh"
The stamps printed in sheets of reduced format with design of fields, sheet contains 6 (2x3) stamps. 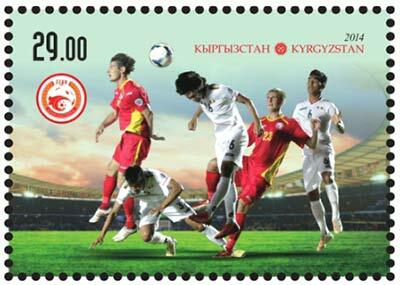 Sheet size is 100x105 mm., and stamp size is 40x28 mm. Eighth standard edition. Monument "Aikol Manas"
The stamps printed in sheets 91 (7 Х 13). 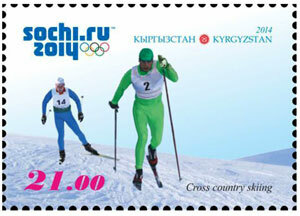 Size of stamps is 18х26 mm. 761. 20.00 Monument of "Aikol Manas"
762. 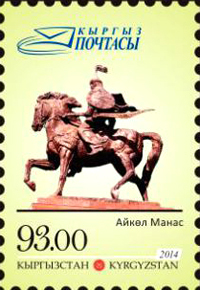 23.00 Monument of "Aikol Manas"
763. 30.00 Monument of "Aikol Manas"
764. 93.00 Monument of "Aikol Manas"
765. 100.00 Monument of "Aikol Manas"
National winter sport "Chana tepmey." Joint issue of Communications Administration RCC member countries. 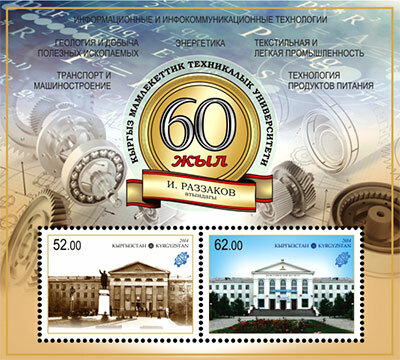 The stamps were printed on sheets of reduced format with design of fields in the sheet 6 (2x3) stamps. Sheet size is 100x105 mm., stamp size is 40x28 mm. 767. 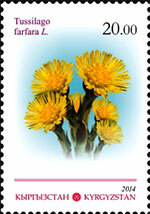 20.00 Tussilago farfara L.
769. 35.00 Ziziphora clinopodioides Lam. 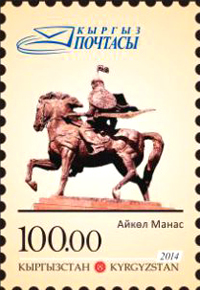 770. 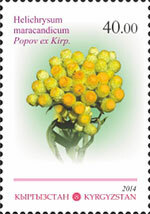 40.00 Helichrysum maracandicum Popov ex Kirp. 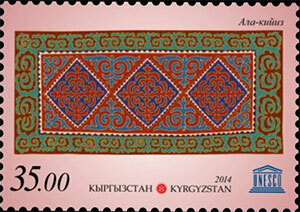 The stamps printed in small format with design of fields in a sheet of 10 (2x5) stamps and quartblock. Sheet contains 4 quartblock. 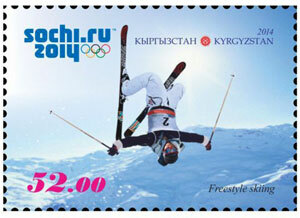 Size of the stamp is 40x28 mm. 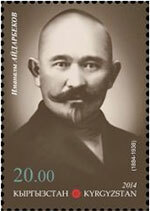 All stories of stamps were printed in a block with margin design. 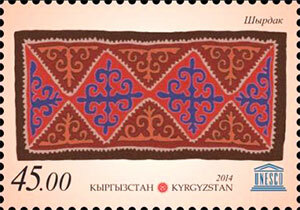 Block size is 100x90 mm., stamp size is 40x28 mm. 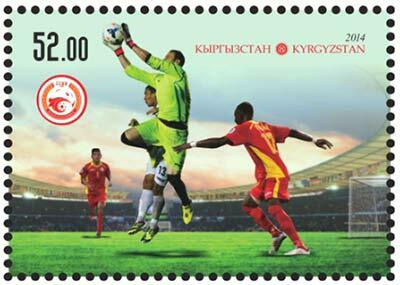 The stamps printed in sheets of reduced size, the sheet contains 6 (2x3) stamps. Sheet size is 100x105 mm., stamp size is 40x28 mm. 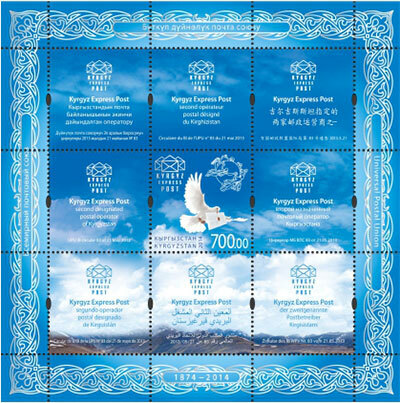 The stamps printed in sheets of reduced size, the sheet contains 5 stamps and 1 coupon. Sheet size is 100x105 mm., stamp size is 40x28 mm. 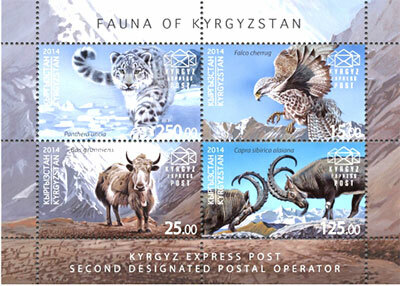 The stamps printed in sheets of reduced size, the sheet contains 6 stamps (3x2). 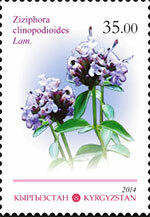 Sheet size is 100x105 mm., stamp size is 28x40 mm. The stamps were printed in the blocks with 2 stamps. 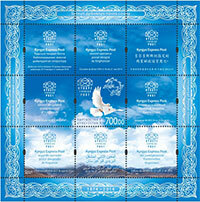 Block size is 100x90 mm., stamp size is 40x28 mm. ITU Plenipotentiary Conference 2014. Busan, Republic of Korea. 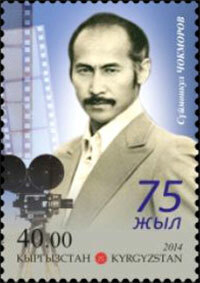 The stamps were printed in the blocks with 2 stamp. 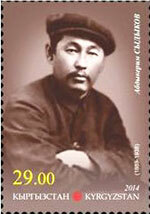 Block size is 90x90 mm., stamp size is 40x28 mm. 787. 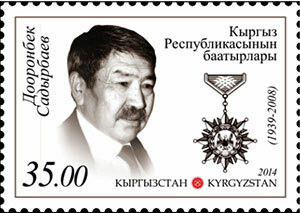 30.00 Emblem of the Union and the logo of the Plenipotentiary Conference. Telecommunications - the realities of the modern world. 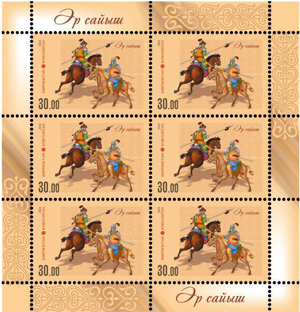 The stamps printed in sheets of reduced size, the sheet contains 6 stamps (3x2). 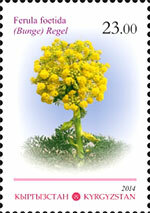 Sheet size is 100x100 mm., stamp size is 28x40 mm. 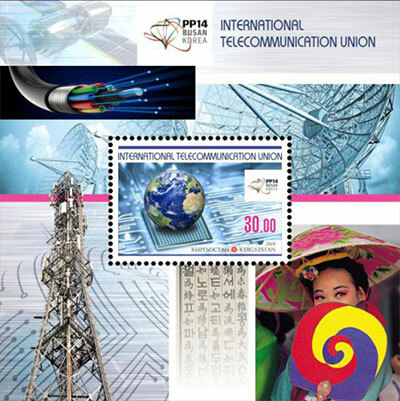 140 years of Universal Postal Union. 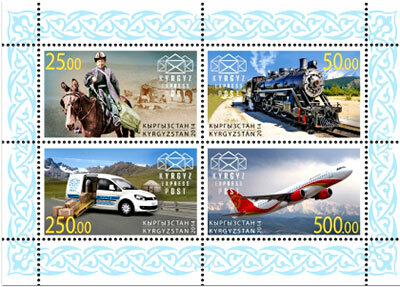 Postal Transport Kyrgyzstan. 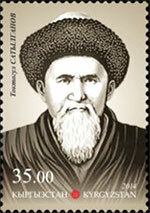 The stamps are printed in small blocks and sheets. 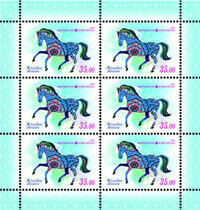 The block size is 134x134 mm., stamps size is 40x28 mm. Size of small sheet is 113x80 mm. 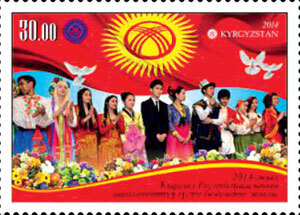 Size of stamp is 46x27,5 mm. 792. 50.00 Mail delivery by train, the beginning of the ХХ century. 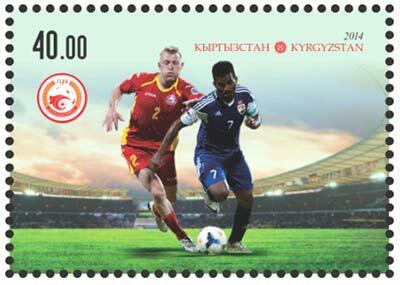 The stamps are printed in small sheets and contains 4 stamps. Size of small sheet is 113x80 mm. 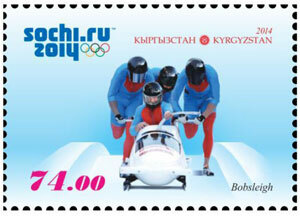 Size of stamp is 46x27,5 mm. 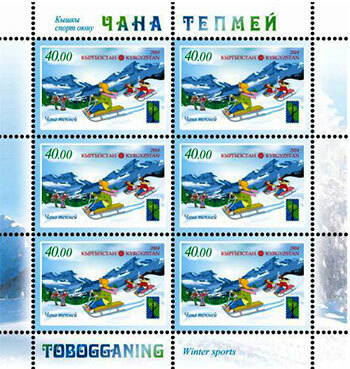 The stamps were printed in sheets of reduced format, sheet contains 4 (2x2) stamps. Sheet size is 130x120 mm., stamp size is 52x37 mm. 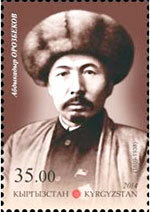 The stamps were printed in the blocks containing 2 stamps. 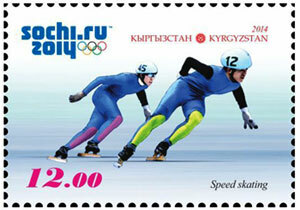 Block size os 125x55 mm., stamp size is 40x28 mm. 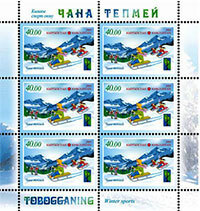 The stamps were printed in sheets of reduced format, sheet contains 6 (2x3) stamps. Sheet size is 100x100 mm., stamp size is 40x28 mm.